Much has been said about the need to construct a new healthcare facility in midtown. And much has been said about the need to preserve the Pevely and the urban character it provides to the city and the pedestrian realm. It’s absolutely critical to point out that the two needs are not mutually opposed. The urbanist and preservation communities have no issue with SLU building a medical facility, in fact quite the opposite. The issue is not whether the facility should be built, but where. The neighborhood needs more density and activity, especially at this critical intersection. A new healthcare facility, if designed with sensitivity to the now dwindling urban context, would also heavily contribute to connecting South Grand with Grand Center and creating a unified corridor. 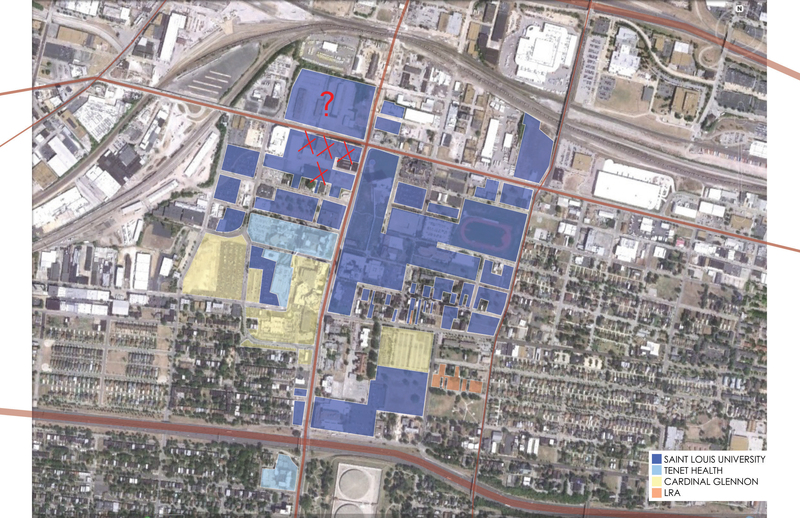 Saint Louis University owns large amounts of land in the surrounding neighborhood and could- should be a part of the solution to this fragmentation. In a neighborhood that desperately needs so much investment, why would anyone spend $890,500 to destroy a historic register building? Especially when they own a massive vacant lot directly across the street. Entire blocks have been demolished as recently as last year. Others have a holdout or two, saving the block from complete vacancy. A map of SLU's real estate holdings in the neighborhood. The four 'X's represent the various buildings on the Pevely complex. The "?" sits on the now vacant and already graded lot across the street. What SLU's plans are for the lot is unknown. For all the talk about SLU’s vast real estate holdings, one particular collection of parcels has not been discussed much, if at all. It’s larger than the Pevely site, has recently been cleared of buildings (that nobody will miss), and happens to be located directly across the street from the Pevely. In other words, it has precisely the same geographical benefits as the Pevely site, and is bigger. 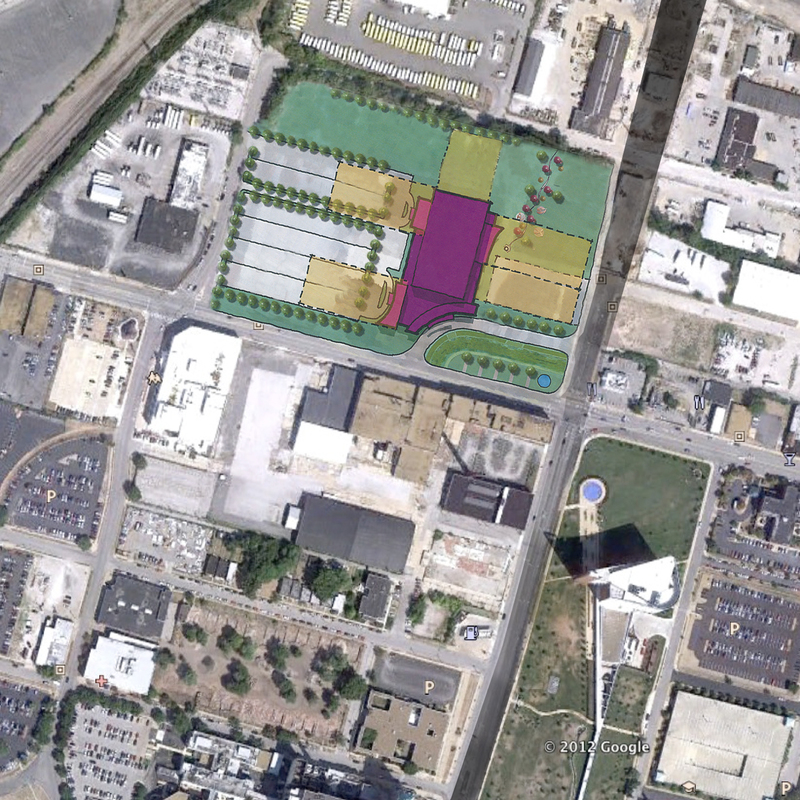 SLU's currently proposed site plan showing future expansion of the facility. 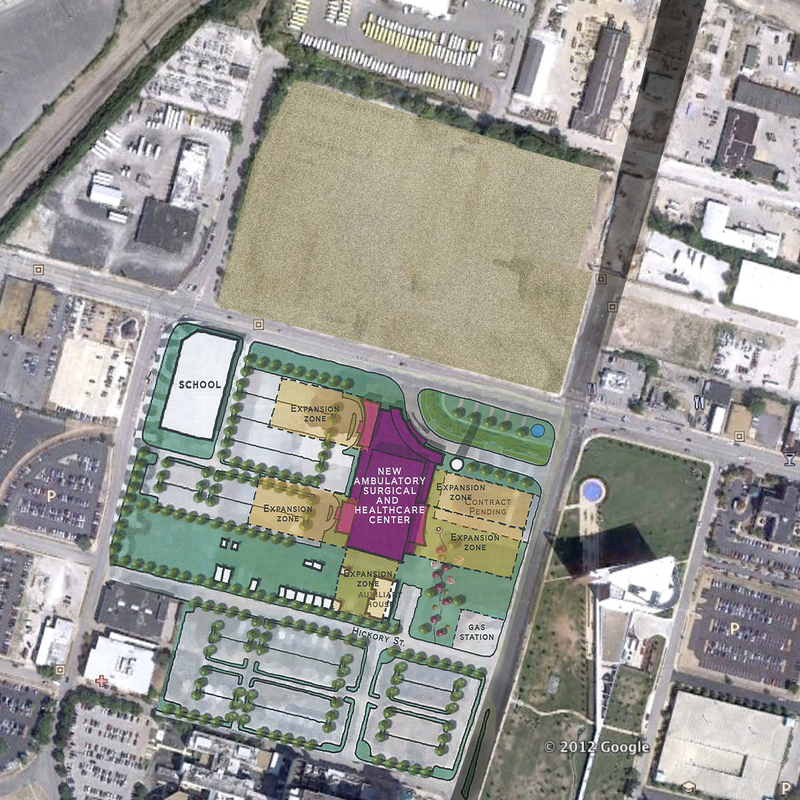 Image includes Lawrence Group's site plan within its context. Above is the proposed construction of this much needed Ambulatory Surgical and Healthcare Center, as currently designed by Lawrence Group. Below is how, without hardship, SLU can use the design that’s already been devised, saving themselves almost a million dollars in demolition costs, while simultaneously saving the Pevely and the numerous other buildings in the planned complex’s destructive path. All it takes is simply mirroring the design across Chouteau. Site plan that mirrors Lawrence Group's design across Chouteau, saving the Pevely complex and filling in huge gaps in the neighborhood. The adjustment needed to save a neighborhood’s worth of historic buildings while still creating a healthcare complex is frustratingly small and simple. By simply mirroring the design across the street, the medical complex would have even more parking and could still utilize the massive parking lots that surround the Pevely. Furthermore, since the all glass entry façade would face south instead of north, this new building orientation would be more energy efficiency, cutting down on long–term operating costs for the facility. When the time is right, the Pevely could be then be rehabbed with a use that actually suits it. Perhaps SLU could address the concerns of their students, who have complained in places as formal as the student newspaper of a student housing crisis, Saving almost a million dollars in demolition costs would go a long way towards converting the Pevely into something that contributes to the neighborhood, and to the new healthcare facility located across the street. Unfortunately, SLU has not released what they have planned for the massive, recently purchased parcel, and to my knowledge, nobody has asked them. Therefore, we are left only to speculate. There are countless productive possibilities for such a high profile corner lot. And yet, imagine the travesty of this empty site becoming a parking lot for the medical building that would replace the Pevely. Until SLU releases something resembling a master plan for the area, we won’t know. At the moment, the plan appears to be centered on creating a neighborhood-wide blank slate through systematic demolition. The demolition of various buildings at the southeast corner of Grand and Chouteau preceded the Pevely debate by a few years. In addition to the Pevely complex, the proposed plan would eventually result in the demolition of at least three more historic buildings- that SLU doesn’t presently own. The parking lot to the south of the proposed facility was recently a residential neighborhood. When does it stop? This is not an example of city building, but rather the deliberate dismantling of one. This would be hyperbole, but it’s difficult to overlook the fact that the landowner chooses, even fights for the demolition of a landmark building while they own an equal, if not better parcel, literally across the street. The term landmark is defined here by the fact that the Pevely is simultaneously highly recognizable, visible from a distance, and on the historic registry. 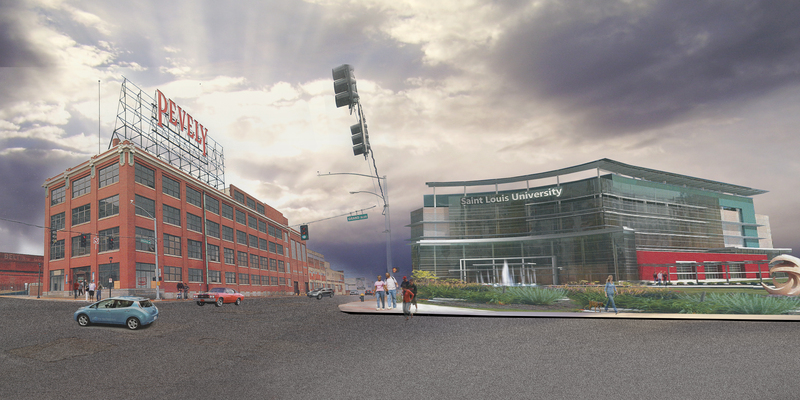 The Pevely is a landmark in every sense of the word, and SLU should embrace it. That anyone would consider a “museum” on the ground floor of the new medical building an adequate “preservation of St. Louis heritage” is laughable at best, offensive at worst. We need to start thinking differently about our city. Cliché as it is, St. Louis really can have its cake and eat it too. This is not difficult. The city has the problem of too much vacant land. Let’s try building on some of it. St. Louis has a beautiful smile; we’re just missing a few teeth. Let’s take care of the teeth we have left and find a way to fill in the gaps, perhaps with some nice bling to really make our smile shine. that’s the one i’m talking about. i just hadn’t considered that SLU may be planning to use it as surface parking should the ambulatory center be built on the Pevely site. by the way, you should email this to Biondi and crew. You obviously aren’t familiar with the area. The only thing at the intersection of Chouteau and Grand is a run down seafood joint and empty beer cans littered all over the street. The north side of the Pevely lot doesn’t have a sidewalk, and simply collects trash. SLU has revitalized Midtown. Rather than sit empty and collect damage and graffiti, the Pevely building site is much better used as a healthcare establishment. The most likely reason that SLU wants to build at the current Pevely site is to promote continuity to the SLU Hospital/ SLU School of Medicine complex. How’d that strategy work? Looks like they’ve knocked quite a bit down, ruined the iconic sign and some unique terra cotta features, and… nothing. Biondi is gone, and the city is left with an even larger wasteland. That’s an ininogeus way of thinking about it.